This simple formula uses the Law of Biot Savart, integrated over a circular current loop to obtain the magnetic field at any point along the axis of the loop. B is the magnetic field, in teslas, at any point on the axis of the current loop. The direction of the field is perpendicular to the plane of the loop. r is the radius of the current loop, in meters. 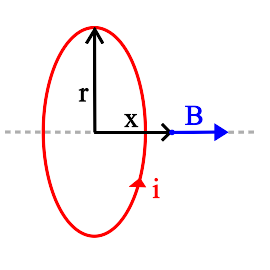 x is the distance, on axis, from the center of the current loop to the location where the magnetic field is calculated, in meters. where A is the area of the current loop, or $\pi r^2$. The following IPython code illustrates how to compute the on-axis field due to a simple current loop.